The secret to making a lining without needle and thread? 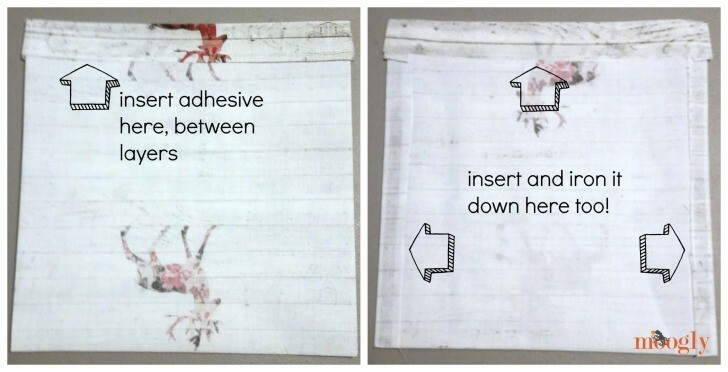 Iron on adhesive! This comes in a few different brands and strengths, but they are all basically the same. 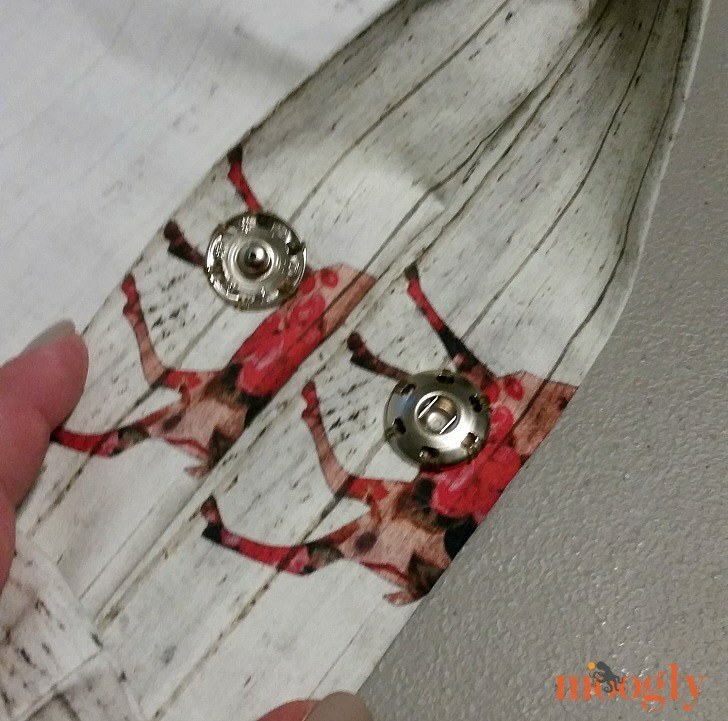 You place a strip of the iron on adhesive between 2 pieces of fabric, apply a hot iron for a few seconds… et voila! A no sew seam is made! For this demo, I used Heat n Bond Hem in Regular Strength. This is a popular brand, found in most big box craft stores, and in the craft department of lots of big box department stores. Another popular brand is Dritz Stitch Witchery. Any of them should do the job, but I would recommend either Regular or Ultra strength – not Light. And let’s make a bag lining! Step 1: Measure your bag. This one has a measurement of 10″ x 10″ (excluding the handle of course). Step 2: Cut the fabric to the width of the bag, plus 1″, and to the length of the bag x 2, plus 2″. For this project, my fabric is 11″ wide x 22″ long. 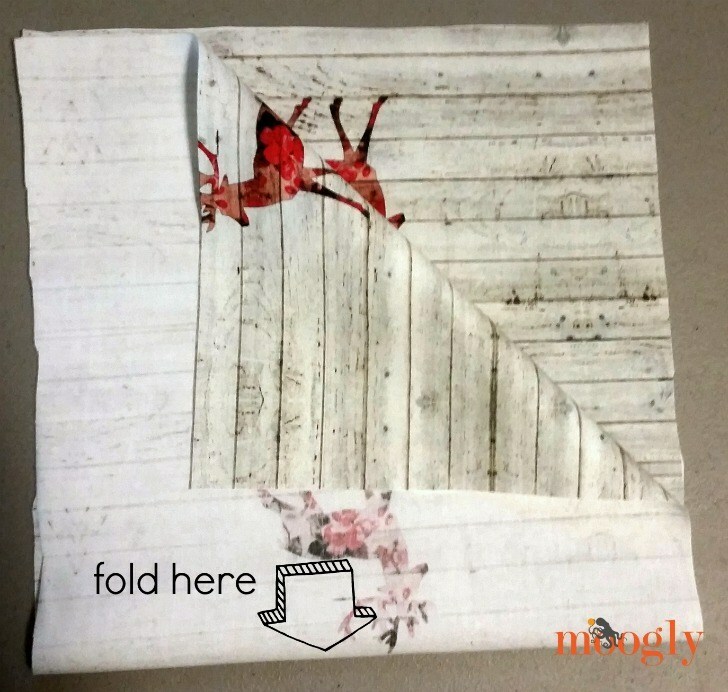 Fold the fabric in half (the fold becomes the bottom of the liner), right sides together. 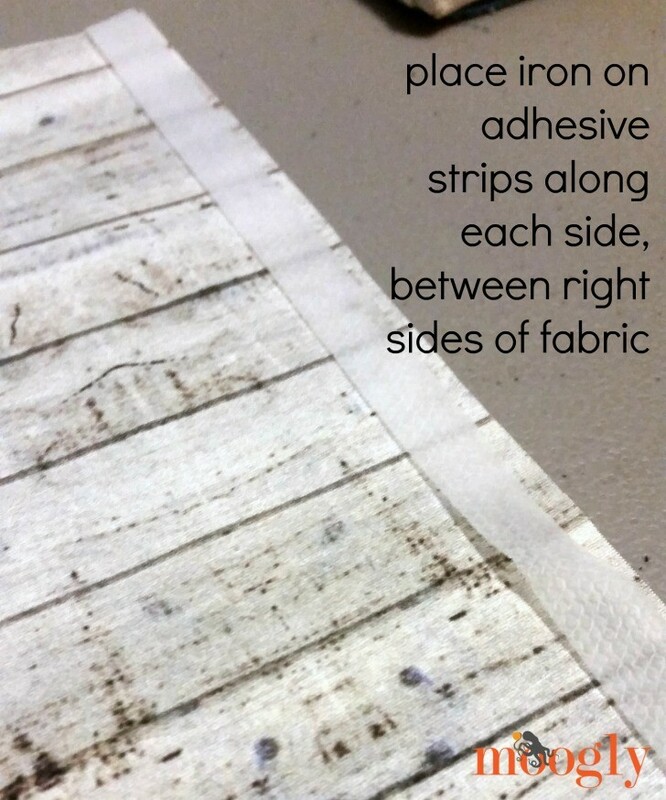 Step 3: Cut 2 strips of iron on adhesive the length of the sides of the liner. For this project, I cut 2 strips 11″ long. 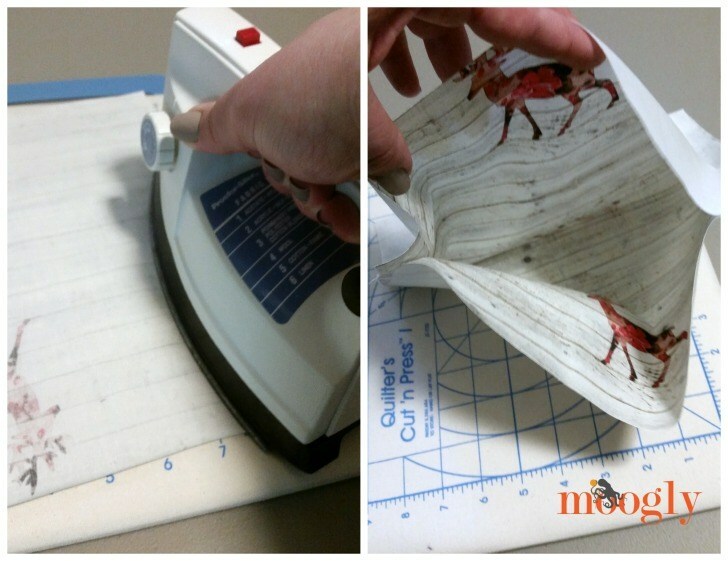 Place the iron on adhesive between the layers of fabric, on each side. 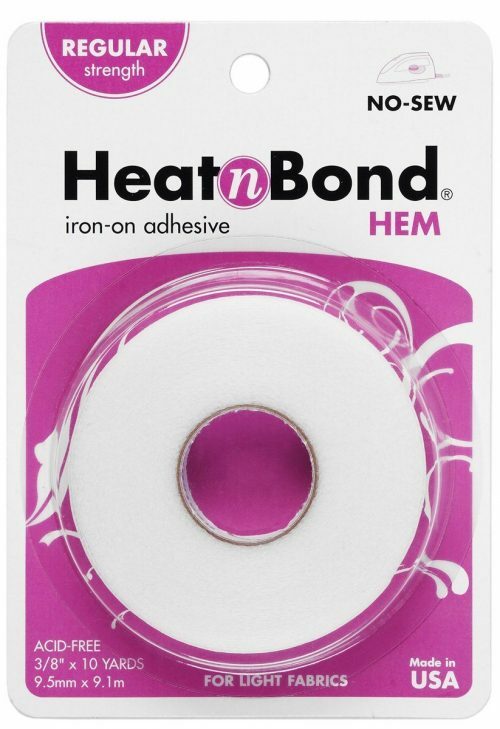 Step 4: Preheat the iron to Medium heat, or the heat directed on your package of iron on adhesive. Check this heat setting on a scrap of leftover fabric, to be sure it won’t hurt the fabric you’ve chosen. When the iron is hot, press it on the fabric for about 3 seconds/section, or as directed on the iron on adhesive package. Step 5: Fold the sides with the adhesive in, and then fold over the top of the bag liner, to the outside, to create the upper lip of the liner. Check it against the bag you are lining to make sure it is the right size. 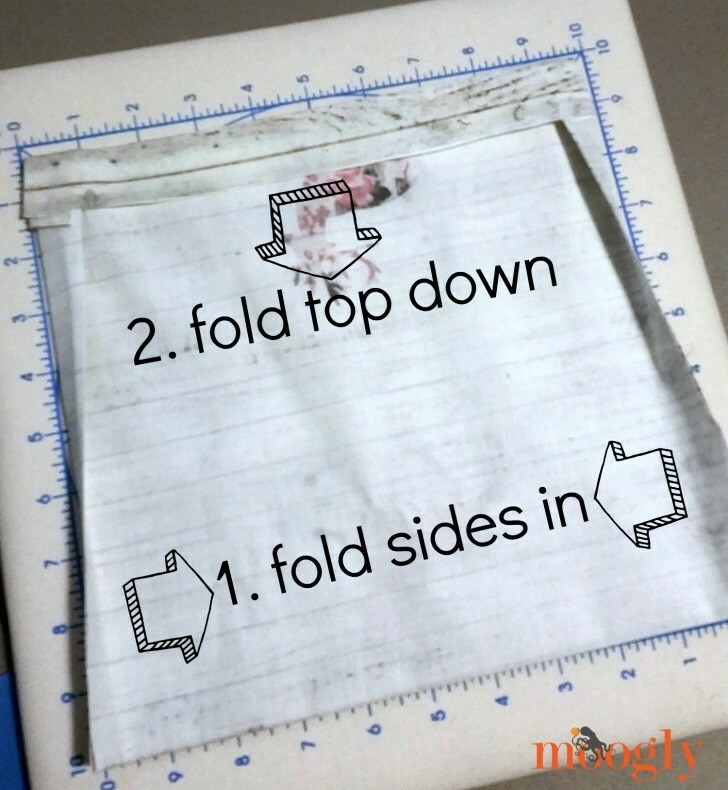 Step 6: Using more iron on adhesive, iron down the folded over sides as well as the folded over top. Step 7 (optional): Using sewing needle and thread, add snaps to liner if desired. Step 8: Insert the lining into the crocheter/knitted bag. 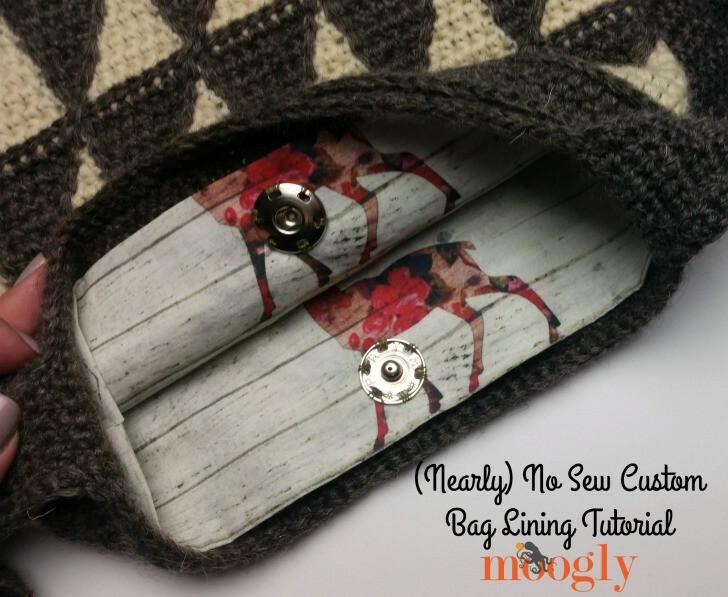 How you attach the bag and lining is up to you! This is where you may have to do some hand sewing, to sew it in securely. 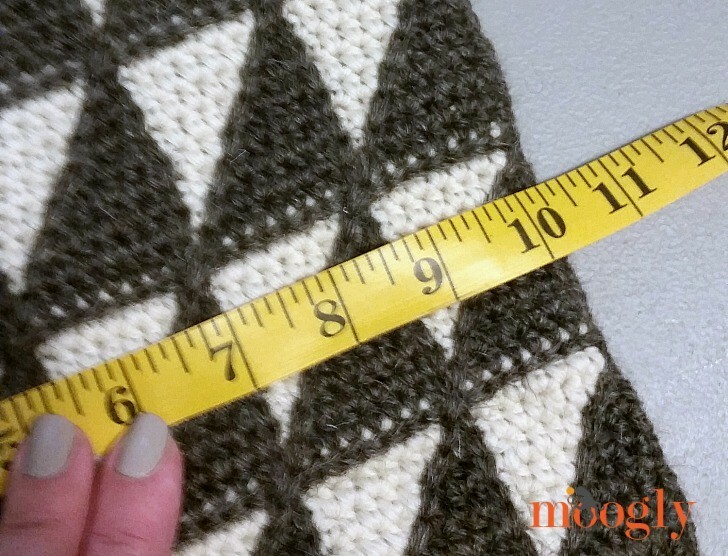 Another option is to make a swatch using the yarn you made the bag with, and test it with a scrap of your fabric and a couple inches of the iron on adhesive – ONLY IF you are using wool or cotton, not acrylic yarn! Acrylic will melt! But if your test is successful, you may be able to iron in the lining into the bag as well! That last step will definitely require some testing on your part. 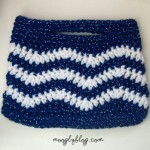 In this tutorial I used a bag crocheted with Lion Brand Fishermen’s Wool, which recommends that you do not iron it on the label – even though it is 100% wool. So I decided to do my own experiment… and it worked just fine! I ironed it on, and let it cool over night. 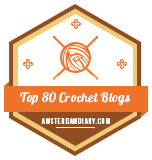 And it was firmly stuck to the crochet, and the crochet part looked fine! If I hadn’t stopped to take photos, creating this bag lining would’ve taken just a few minutes! Sewing in the snap probably took the longest time, and of course that part is optional. 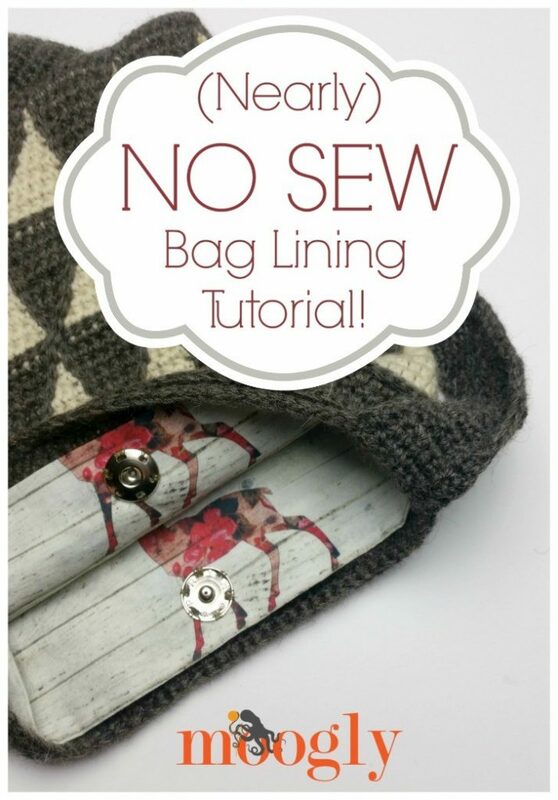 If you do sew in a snap, it’s nice to add a button on the outside of the bag, opposite the snap – it helps you find the snap easier to open and close the bag, and buttons go a long way to making a bag your own too! I really like your lining and animal buttons! 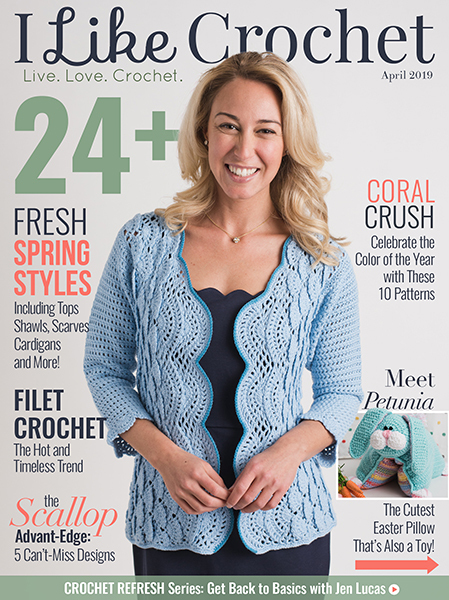 Nice idea for the crocheter who doesn’t own a sewing machine. I HATE sewing by hand. 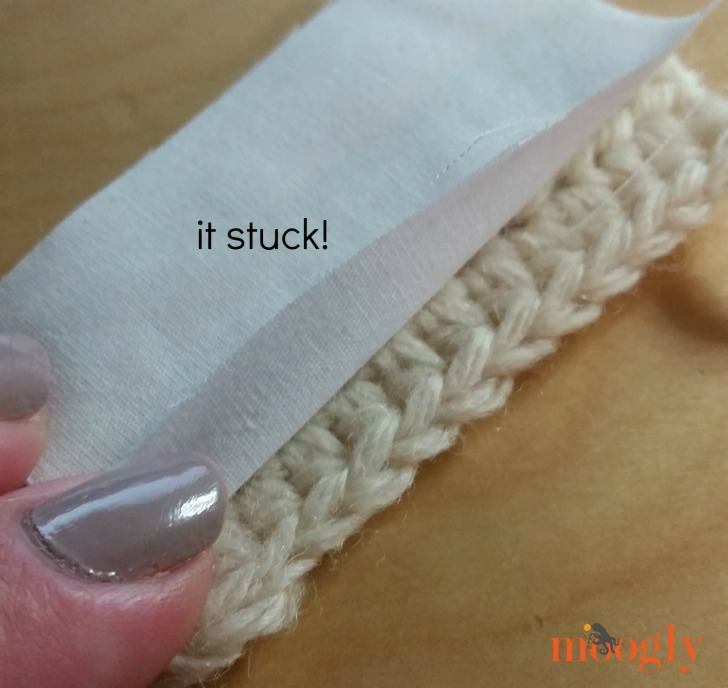 Sewing in a lining is as easy as using a needle to weave in your yarn tails, or stitching two parts of a crochet pattern together. 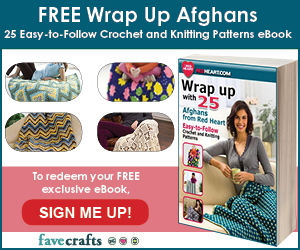 You can use a mattress stitch, running stitch or whip stitch, and if you use a lining fabric that is close to the same color as the crocheted bag itself, you can deconstruct your yarn and only use one strand of it to sew with. But I love this idea and will use it! Just a thought – if you are lining a 10″ X 10″ bag, a fat quarter of fabric is the perfect size (11″ x 22″). You can buy fat quarters at all quilt shops, many fabric shops, and most craft store that sell fabric. I didn’t know that about fat quarters! Thank you Becky! 😀 I’m glad you like it! 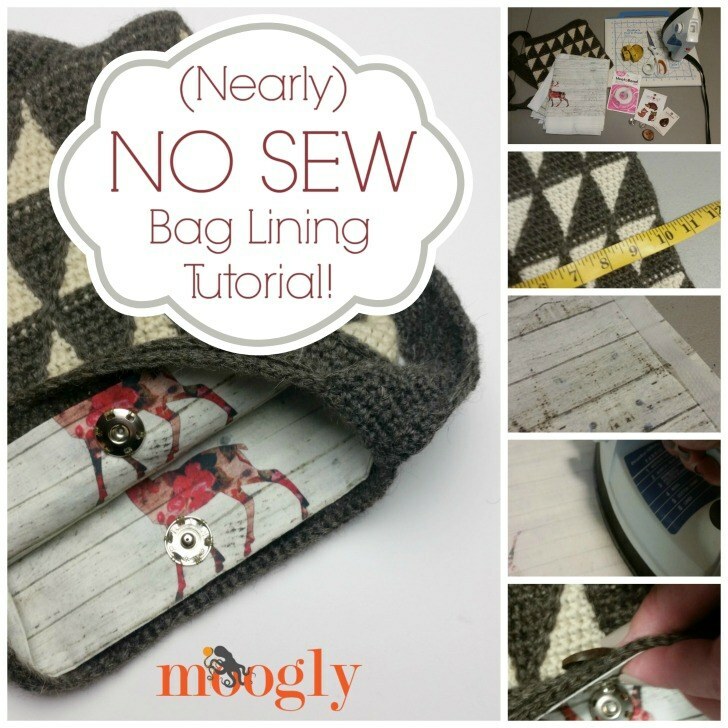 I don’t mind the sewing so much but this is a very well made tutorial. I might have to try it this way for no other reason than to try it. Thanks for a great website! Whenever I want to start a new project I often come here first to see if you either have a pattern or if you have a link to a good one. I realize that a lot of hard work goes into it and you should know that very many people appreciate it! So thank you! 😀 Thank you so much Lizette! I really appreciate you saying so! 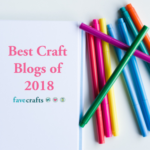 I’m a huge fan of your patterns and tutorials! I saw a product at Michaels’ last night that looks like it could be an alternative to fuse the fabric to acrylic yarn – no sew, no iron. It’s called Peel n Stick fabric fuse. I haven’t tried it yet so I don’t know how well it works. I’ll have to get some next time I go, I would love to try it with your easy liner tutorial. Thank you for all that you do, Moogly has always been one of my favorite sites! 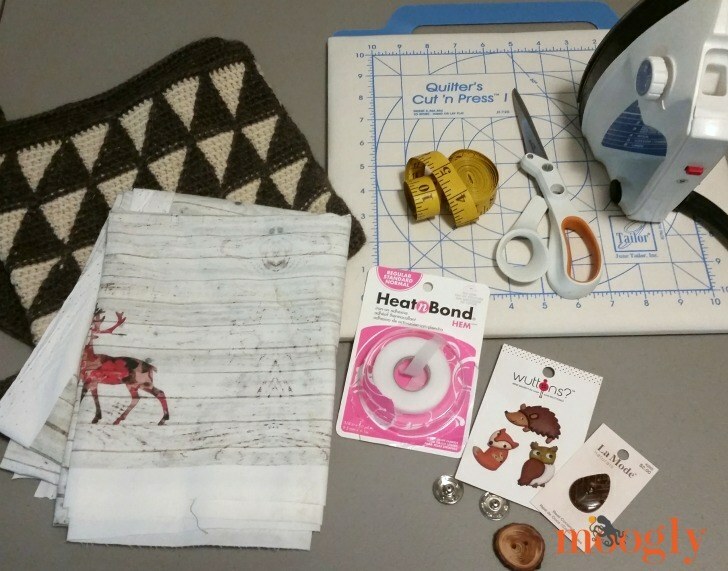 Thanks Tamara, what a fantastic and easy way to make a lining for crochet bags. 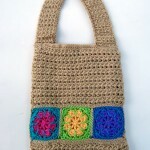 I have a few crochet bags that I want to try this eith idea! I agree with others. This is a fantastic idea! I never thought of this and I am SO glad you did! Thank you so much for this idea. I really want to make bags of all kinds and now I know that those that need a lining will not stop me. 😀 Thank you so much Patricia! Hate sewing. Love it! Thanks. I love your newsletter & the cool patterns. 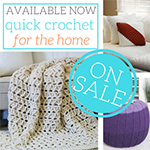 When I’m crocheting, I don’t like to stop crocheting to sew something together to complete the project. I like the fusion tap. 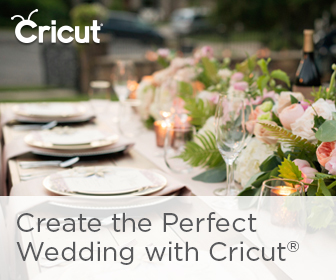 I’d love to the the happy receipent of one of your crochet hooks. They appear to be quality made hooks. Thank you for the giveaway. Be thankful in all things! Great idea, iron on tape. I’ll try that. I still would attach smaller pockets to lining (sewing them on) “before” attaching to bag. I like pockets. 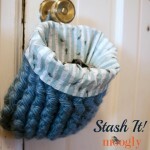 An easy way to have inner pockets for a crocheted (knit, or hand sewn, or bought) bag & not have to sew, is to use a purse drop in bag liner that has lots of pockets. They come in small & large sizes. Also, when I fly, I use a very small travel size shoulder bag for a tiny project bag (crochet flowers, baby hat, bootees, etc) with the tools I need, round tipped snips, & a few ptns I’ve printed up from pc, into 4ths to fit in front pocket, & it fits in my carry on bag. I also use a big purse as my carry on bag, (or a medium size duffle bag that is allowed size) & pac my medium size purse, in front pocket of suitcase. Great ideas, thank you Tamara! Thanks so much for such a great idea. I truly enjoy your email letters and all the great projects and tips. Keep them coming! 😀 Aw, that’s awesome Brenda! Thank you so much! And please tell your mom I said Hello! What a total gift this tutorial has been for me! 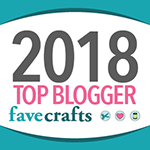 Thank you soo much for sharing this, I was panicking after sewing my first bag project for my friend’s daughter (birthday in 3 days, what was I thinking? ! ), then realised interior was a bit… ragged. your photos are bang on clear to follow, I can only learn from photos, video and someone actually showing me – totally useless with just words. Oh I’m so glad to hear it, thank you Susie! I, for one, do NOT like to sew! Thank you for a no-sew option!